That’s some name, buddy. Do you even know what a steak is? He doesn’t actually know what it is. He pronounces it “Steek”. Dang, man. This comic is so cool. It pains me that I have to wait an entire week to read it, though. I don’t know, I don’t think he makes for a very good Steak. What I mean to say is, his bones…. …don’t seem to have any meat on ’em. 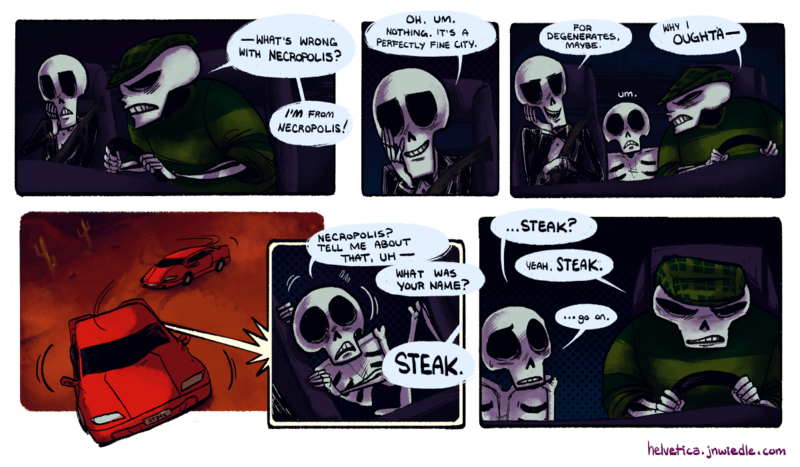 I somehow get the feeling that Steak speaks with a heavy Brooklyn accent or like a Hollywood bad guy circa the 1940’s. Maybe it’s just the clothing. Oh my god. Is no one going to point out that Steak’s first word was “Steak”? Like, just imagine it.